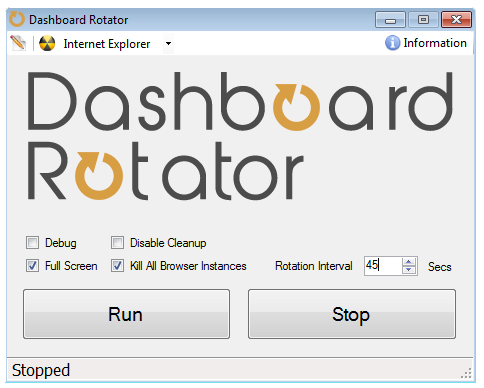 If Internet Explorer or FireFox crashes, or someone closes the browser window, it will be automatically re-opened and kick off a new rotation cycle. 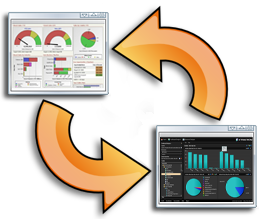 Simply provide a list of URLs and the Dashboard Rotator will cycle through them in a full screen window at customizable lengths of time. No setup is required to run the program. It runs as a standalone executable. Choose from either FireFox or Internet Explorer as the source browser to rotate. Memory managed and built in crash recovery, the browser is automatically restarted when errors are detected and to prevent memory leakage over time keeping your pages loading fast. © Dashboard Rotator 2017. All Rights Reserved.